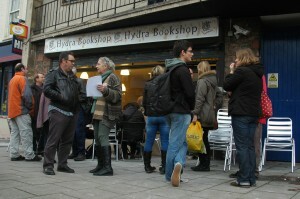 A group of people around the Bristol Radical History Group have opened up a new radical bookshop in Bristol called Hydra Books. Bristol has been without a good dissenting bookshop for a while now, and it’s great to see a new bookshop opening, especially in the face of the usual wave of bad news about the state of the booktrade. Whatsmore, the ARB is now one more member stronger!